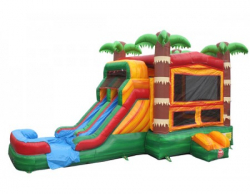 Tropical Paradise Wet OR Dry Slide & Double Bounce Combo Areas w/ BasketBall Hoop, Rock Ledge Wall w/ 16′ Long Lane Slide and 15′ X 30′ Bounce Area OR (2) 15′ X 15′ Separated Areas. There is a zippered/velcro wall between units to have open or closed. 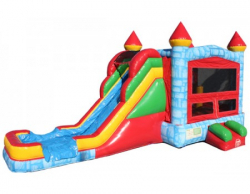 Great to separate age groups or to have a large bounce area for all to enjoy. 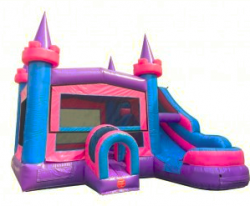 Whether it’s you’re throwing princess tea party or a birthday party with boys and girls the Pink Castle Bounce House Water Slide Combo is fun for everyone, choose from 100+ themed Art Panels like Mickey Mouse, PJ Masks, Paw Patrol or just Happy Birthday or another available from the huge selection. 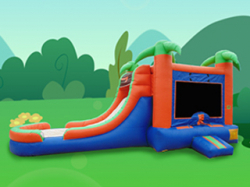 Kids can jump around inside the bounce house and then climb the rock wall before heading down the attached water side slide. This unit is perfect for backyard wild water slide fun. Unit is Due in stock 9/8-9/10/18. 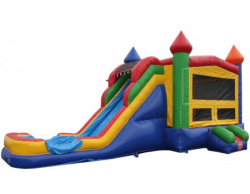 Pick a color… any color for fun on this Multicolor 3 in 1 Bounce & Slide combo with a 15′ X 15′ Bounce Area and 16′ long slide. This unit is available WET with a pool attached at the bottom of the 16′ long slide. The 40 FOOT WET Obstacle course WATERPARK has two lanes through seven different challenges! Your guests will crawl through tunnels, jump through holes, squeeze between log jams, pinball their way through biff n bash poles, climb the 8′ ramps, and scream down a 16′ waterslide! 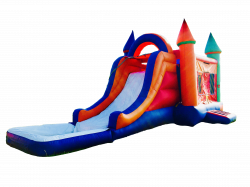 Bounce Combo w/ BasketBall Hoop, Rock Ledge Wall w/ TALLEST Wet OR Dry SLIDE AVAILABLE IN A COMBO and 15′ X 15′ Bounce Area. Rent just as you see in picture or choose From 100+ Themes available for your event or party. Everything from Happy Birthday to the hottest kiddie trends on television. 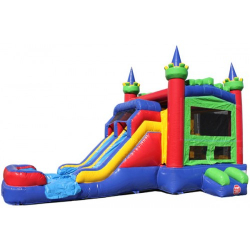 MultiColor Castle 5 In 1 Double Water Slide & Bounce Combo w/ BasketBall Hoop, Double Rock Ledge Wall w/ 16′ Long Double Lane Water Slide and 15′ X 15′ Bounce Area that has Interactives that jump with you. Rent just as you see in picture or choose From 100+ Themes available for your event or party. Everything from Happy Birthday to the hottest trends such as Mickey Mouse, Paw Patrol or PJ Masks to name a few. This unit is in transit from manufacturer, we will confirm availability when order is received.